EDIT 22/07/2017: Added extra video. In part one of this series, we highlighted how Carl Lentz tries to “uncool” himself and his Hillsong church in America. The ‘forked tongue’ of Hillsong and the ‘genuine’ Carl Lentz (Part 1). In part two of this series, we heard ‘uncool’ Carl Lentz launch a protest against ‘boring’ churches and wants people to see Hillsong church “cool, fun” and so on. 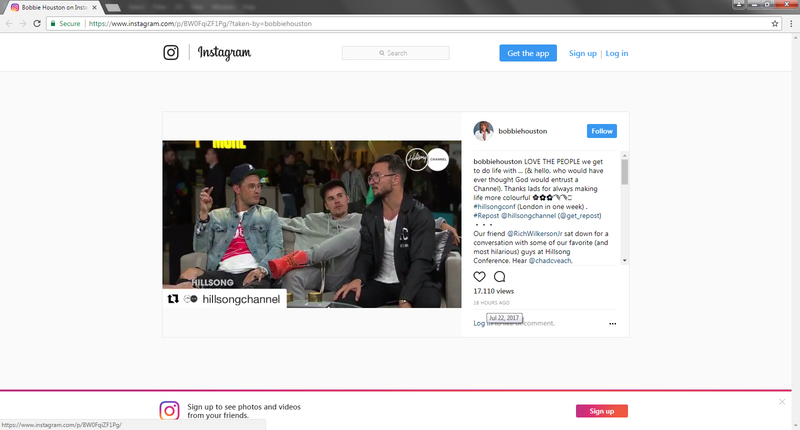 The ‘forked tongue’ of Hillsong and the ‘genuine’ Carl Lentz (Part 2). In part three, we highlighted how Hillsong go out of their way to mimic the world and propagate a ‘celebrity culture’. In part four, we looked at WHY Hillsong continually go down this superficial ‘cool’ road at the expense of the genuine Christian faith. In our last article, we simply quoted what leaders of Hillsong were saying to the media about Justin Beiber. In this article, we will show you how Hillsong exploit people (in order to promote their movement) by examining their lies to the media article part 5. In the New Apostolic Reformation, they believe in what’s called the Seven Mountain Mandate (also called seven pillars/spheres/mountains/etc). Christians in places of high influence in the ‘marketplace’ on these mountains are not treated as regular workers. They are regarded as workplace apostles. They are in these positions to transform or influence the culture through their ‘mountain of influence’. So it’s perhaps disingenuous of Carl Lentz to make the claim that a TV host or a celebrity will be treated like everybody else. Hillsong Conference – Promoting the NAR 7 Mountain Mandate. In the PDF article above, you will notice that so-called ‘workplace apostles’ Carl Lentz and others are teaching people ‘how to reach and influence the world through this pillar of society’. And Hillsong makes it clear that leaders like Carl Lentz are ‘influencing their pillars’ with the message of Jesus. It was our prediction, before the Sunday World story broke, that Hillsong was going to prepare their ‘Christian’ celebrities to start their own Christian channel. We had no idea at the time that Hillsong was about to launch their own Hillsong Channel. LOVE THE PEOPLE we get to do life with … (& hello, who would have ever thought God would entrust a Channel). Thanks lads for always making life more colourful 🌸🌼🌺🌾🌾🕊 #hillsongconf (London in one week) . So watch this space. From personal experience in the Hillsong cult, we are aware they treated some people as simply ‘assets’ (especially if you have the voice, the looks, the money or the influence). The link below shows Hillsong allowing their own celebrity Justin Bieber be ‘as normal as he can’ – treating him as if ‘he’s no different’ to anybody else. Giving a whole new meaning to the word ‘normal’? Source: Laura Lentz, Instagram, https://www.instagram.com/p/BV-UGhsjiZi/, Published 01/07/2017. “Oh no she didn’t!” you might say. “Oh yes she did!” we say. He jetted into Sydney earlier this week to attend the Hillsong Conference. And on Wednesday, Justin Bieber attended an evening session wearing a casual, but very expensive, ensemble. The Canadian singer, 23, donned a Supreme x Louis Vuitton hoodie that costs around $1130, with ripped jeans and trainers. It’s not just Hillsong leader Carl Lentz ‘promoting’ Beiber in front of thousands of youth. Hillsong leader Phil Dooley, senior pastor of Hillsong Africa was the one with the mic giving Bieber the platform in the above video. So much for Joel Houston stating Hillsong is trying ‘to just keep [Beiber’s] life as private as we can’ – when Carl and Laura Lentz (apparently his pastors) are raiding his expensive wardrobe and wearing them at Hillsong. So much for Carl Lentz claiming Bieber was ‘just a face in the crowd’ where he could have the ‘chance to be as normal as he can’. Not only does Carl flaunt his wealthy celebrity friends, what message do you think he was sending by wearing Justin’s clothes? Particularly the Louis Vuitton Supreme sweater that cost $1,130. But it didn’t stop there for Bieber being ‘just a face in the crowd’. He had even more time backstage, his face broadcast to millions around the world through Hillsong’s livestream. Filming his presence among the backstage crowd where these hosts interview Hillsong leaders does not, in the slightest, reinforce that Bieber is ‘just a face’. In fact, it reinforces the idea that he is being groomed by Hillsong to be the Christian celebrity face for their movement. Nevertheless, it appears Justin seems to realise he is being played by Carl Lentz? So while capitalizing off Beiber’s celebrity status, raiding his wardrobe and “living the dream”, Lentz then has the audacity to claim living the dream ‘looks like Ephesians 3:20 to be honest with you’. This is a cult leader. A prosperity pimp. A liar – twisting the word of God to manipulate people (like Bieber) to live what he thinks is the Ephesian 3:20 ‘dream’. Carl Lentz is called to faithfully handle the scripture, not twist them to justify living the pulpit-pimping life off the back of his wealthy friends. This is the context of Ephesians 3:20. Is this about living the dream? If your pastor is ‘pimping’ you to live the dream, you need to find another church. And if your church is part of the New Apostolic Reformation cult, then you are simply an asset to the leadership. Nothing more. Host: What have you been doing this conference? Host: What does that look like? Carl Lentz: See what I did there. So my mate[ ?] [Referring to Beiber] sets me up here. Host: So there’s more Carl Lentz: We came over with some ideas. The theology ticking under the hood of New Apostolic Reformation cults centers around the leaders of the movement. The theology itself makes its leaders ‘little gods, new breeds or divine’ – agents who market the stage for their followers so they too can step into their dream-destiny, purpose and best life now. We just heard above, that Carl Lentz attributes this to himself (the Ephesians 3:20 life). Carl Lentz happily misleads the media to promote Hillsong and his own narcissistic leadership style. Narcissists are ATTRACTED to these leadership positions and know how to play the ‘genuine and authentic’ card to people who will further their name and image. Carl is no different. Nor is his spiritual oversight, Brian Houston. Email all questions and comments to c3churchwatch@hotmail.com.